Track down the Shrine of the Prince of Thieves location in Octopath Traveler to unlock the Thief secondary job class for all heroes. Octopath Traveler is a game with a considerable variety of options available to players who wish to customize their party and put the hurt down on foes lurking around the continent of Orsterra. Part of that level of customization involves selecting various secondary job classes, and unlocking those job classes requires players to seek out and discover various shrines. 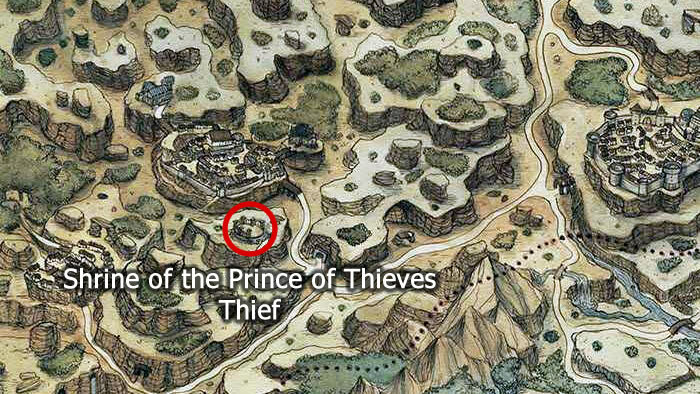 In particular, unlocking the Thief secondary job class requires players to locate the Shrine of the Prince of Thieves, and we know just how to find it. The Shrine of the Prince of Thieves is one of the easier shrines to find in Octopath Traveler. Some shrines are hidden behind cover, obscured from sight, or involve exploring around open areas; this one simply rests at the end of an obvious path that doesn't lead anywhere else. Starting from the save point and sign post due south of Quarrycrest, in the area known as the South Quarrycrest Pass, head west around the cliffside and past the bridge leading south. The path will continue down a short ramp, turn south, then loop back around under the bridge. Walk through the cave opening, follow the path east and north to climb the stairs, then approach the altar. After pressing the A button, the heroes will hear the mystical voice of Aeber, the Prince of Thieves, who will compliment the party for having found the shrine. In reward for their efforts, Aeber will then unlock the Thief secondary job class, allowing all heroes to learn the art of pilfering and take advantage of the thief's specific job attribute bonuses. There are still seven other shrines to track down in order to unlock all the core secondary job classes in Octopath Traveler. To learn where the others can be found, be sure to stop by our Octopath Traveler strategy and guide hub, which also features a deluge of information about job attribute bonuses, skills, boss strategies, how to level up quickly, and more.